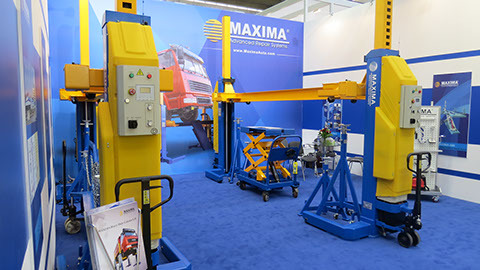 Maxima (MIT Group) have been manufacturing state of the art mobile column lifts since 1992 and are now proudly one of the leading suppliers of automobile repair equipment throughout the world and have annual sales worldwide including Europe, Scandinavia, The USA and Canada ,The Middle East and China. Maxima (UK) represent Maxima and the MIT Group throughout the UK and because we import direct from the manufacturer we are able to pass on not only great discounts but excellent service direct from the factory. Maxima enjoys the advantage of state of the art production and world class inspection systems and quality control in our aim to provide world class automobile equipment. Maxima are pleased to have ISO 9001:2000 certificate and CE certificates to guarantee you the highest safety level and reliability. Call us today and let us show you why our vehicle lifts are quickly becoming the industry’s favourite column lifts. In today’s high tech heavy duty service market, automotive technicians must be able to maximize their space in every way possible and our mobile column lifts help do this and so much more. The mobility of our mobile lifts means you do not have to dedicate valuable floor space to a huge lift system. Each column moves independently and can be moved out of the way when not in use. They can be used indoors and outdoors if necessary. This allows smaller service bays to offer expanded services on a wider variety of vehicles. Working for extended hours every day under vehicles that weigh thousands of pounds can be mentally taxing. The last thing any service technician needs to worry about is their safety. It can be impossible to make accurate repairs if you are constantly worrying about the stability of your existing column lifts. We stand behind the safety of our products 100% so you can rest assured standing underneath them. Our mobile lifts are loaded with powerful features service technicians need the most. • Multiple lifting capacities offer greater service options for any size service center. • Upgrade and expand from the standard 4 post lift system to include 6 or even 8 mobile columns. • Easy to use, see and read remote control handle with convenient 16 foot long cable. • Adjustable wheel supports fit wheels of all sizes. • Safety is ensured at all times with our double safety standards on all mobile lifts. Mechanical locks plus hydraulic flow control offers double the safety precautions. • Each mobile column works independently, but their synchronization is guaranteed by real SCM technology. • A large LCD screen makes it easy to see the current status and condition of all mobile lifts at any given time. • Mobility makes better use of space. Makes working easier, more comfortable and user friendly. • Every mobile lift is ISO9001 and CE approved. While our standard mobile lifts offer enough power to manage most loads, we know some service repair centers need more power to handle the demands of the heavy duty automotive world. Mobile lift models and features are as follows. 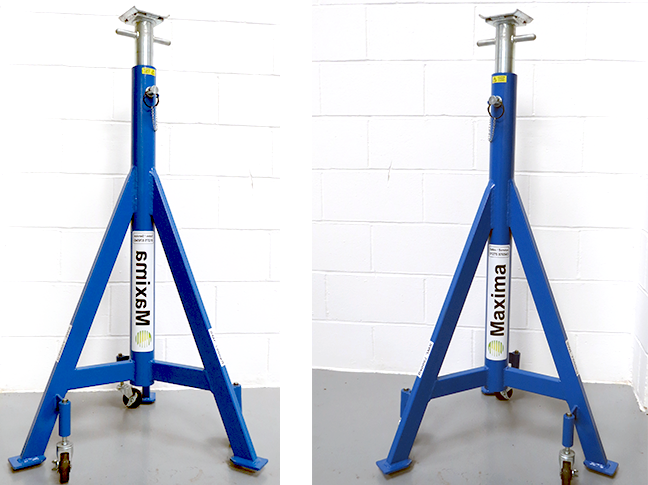 Maxima are pleased to offer 2 year warranty on all mobile column lifts. Our engineers are pleased to assist with any questions or technical advice you may have and offer next day parts and service throughout the UK. Our engineers will offer training when the column lifts are installed at your premises and offer continued help, advice and support..
All lifts are fully load tested prior to leaving the factory and have a second pre delivery inspection ensuring the column lifts meet the highest standards. Goes between two lifts to enable the lifting of a chassis without lifting the wheels. 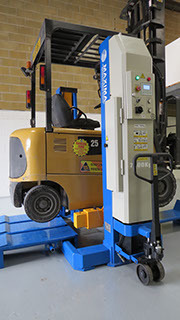 Maxima has developed a unique forklift system that enables the operator to safely lift a forklift by using two Maxima mobile column lifts. The system can safely be operated by one person enabling work to be carried out on the forklift whilst lifted. 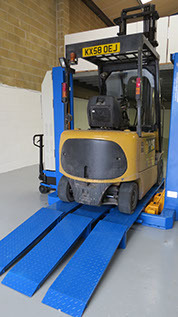 The forklift system is the ideal lift for repairs to commercial forklifts. Suitable for both 3 and 4 wheel forklifts. 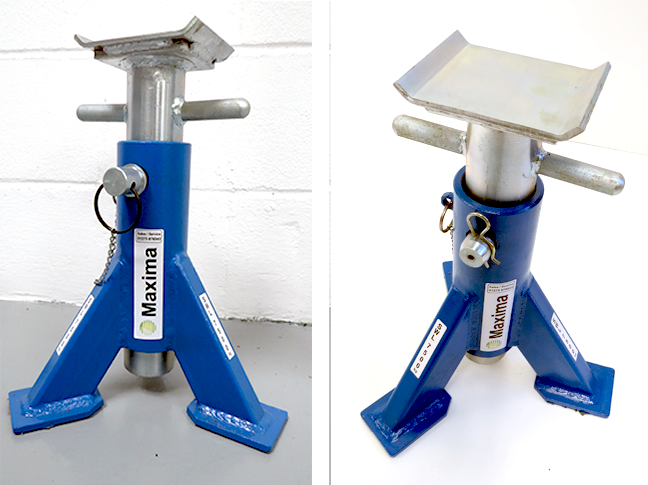 We are very pleased that you have chosen to request information from Maxima UK. Our staff will for sure respond to you with all your questions and queries within 24 hours. Thank you very much.